M2 Training Center was created by David Taylor to help wrestlers learn and achieve their goals on and off the mat. When it comes to wrestling, David has a specific style, score points. Lots of them. 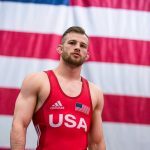 The curriculum, technique, and training are all based around what David has done in the past and what he is doing today as he pursues his own international wrestling goals. David has learned from some of the best in the history of wrestling and aims to help impart the knowledge and mindset necessary to be successful.